Without a doubt, the first Broadway revival of Tony Kushner’s towering two-part work is the theatrical event of the season thus far. I had seen the first part, “Millennium Approaches,” as part of the NT Live satellite transmission, and though I was mightily impressed then, seeing it in person is a much more powerful experience, especially as the performances have only deepened in the transatlantic crossing. The interlocking plot strands were always brilliantly constructed by Kushner and, on this occasion, are illuminated with great clarity by Elliott. Prior Walter (Andrew Garfield) and perpetually kvetching boyfriend Louis (James McArdle) break up when Prior reveals he has AIDS, and Louis can’t deal with the messy consequences. 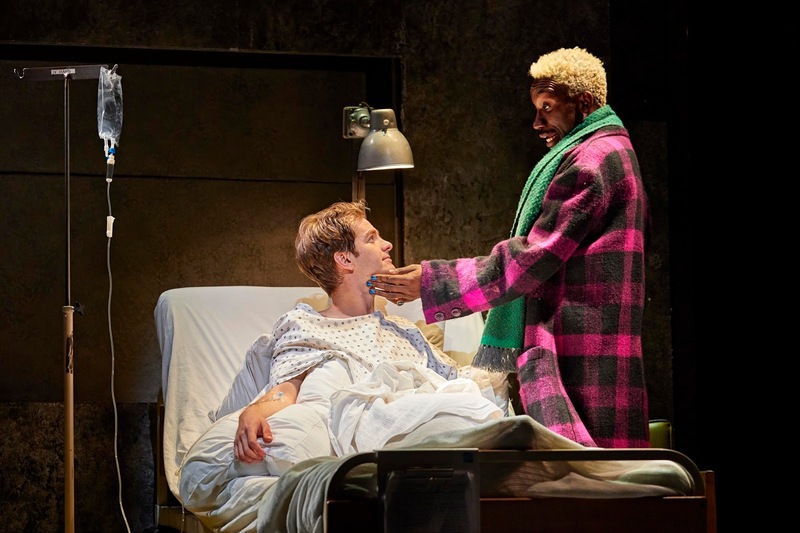 Prior’s only support during his illness is a black nurse Belize (Nathan Stewart-Jarrett), a campy former drag queen. As his illness progresses, Prior starts to be haunted by visitations from an Angel (Amanda Lawrence). 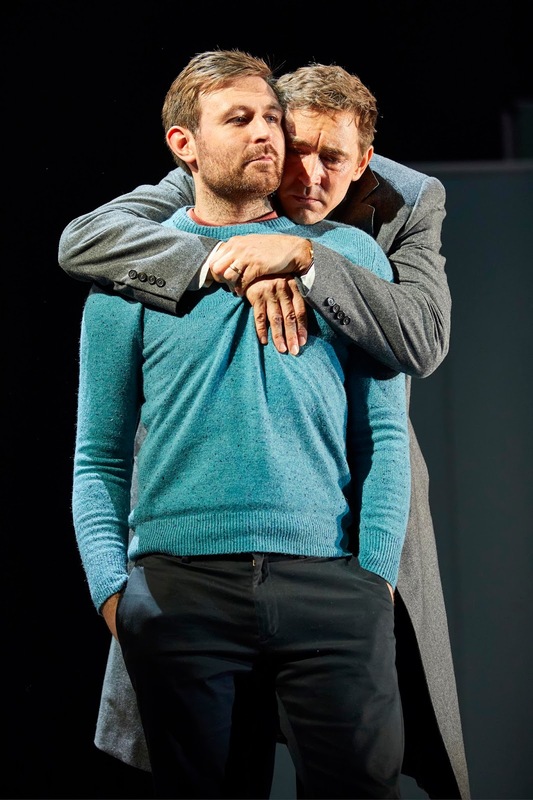 Mormon couple Joe (Lee Pace) and Harper (Denise Gough) are continually bickering as Joe grapples inwardly with his sexuality. Harper doesn’t suspect the cause, but intensely feels Joe’s growing distance from here. Addicted to valium, Harper has dreams and visions in which her dream state communes with Prior. 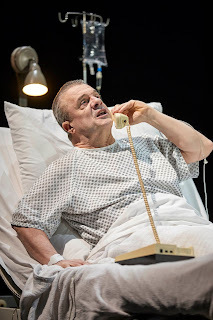 Notorious lawyer Roy Cohn (Nathan Lane), for whom Joe works, receives an AIDS diagnosis while vehemently denying his homosexuality. Roy is haunted by the spirit of Ethel Rosenberg (Susan Brown) whom his machinations sent to her death in the electric chair. Roy’s nurse happens to be Belize who warily bonds with Roy, despite the latter’s racist taunts. Joe’s mother Hannah (Brown) eventually journeys to New York after her son reveals he is gay. Reaganite politics, Judaic and Mormon spirituality, and homosexuality all converge in a brilliant melange in Kushner’s masterwork, which holds its place as one of the great plays of the 20th century. The performances, as noted, are all truly outstanding, and the American accents are even more perfect now from the British members of the cast. 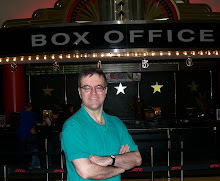 Lane has never been better, though it’s tempting to say that of every role this extraordinary actor undertakes. He’s bitterly vitriolic and volcanic one moment; sympathetically pitiable the next. Garfield captures Prior’s hysterical fear, while skillfully conveying his coming to a sense of his own destiny. Pace, a superb addition to the Broadway cast, poignantly limns Joe’s anguish as he struggles with his sexual ambivalence. McArdle shows Louis to be a perennial chatterbox whose good intentions are somehow are always wrong-headed is so good you really want to smack him. Stewart-Jarrett brilliantly balances the camp aspects of his role with Belize’s deep caring and compassion. 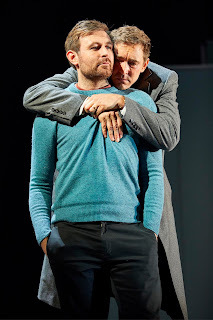 Gough superbly communicates Harper's desperation and needfulness, and growing sense of self as the plays progress. The other women play multiple roles (there’s some doubling among the men, too), and are quite astonishing. The incredible Susan Brown switches deftly between male and female roles, from a rabbi to Ray Cohn’s doctor to “the oldest living Bolshevik” to Joe’s mother, simply extraordinary in each part. So too, versatile Amanda Lawrence morphs deftly between her roles as the fearsome Angel, a Salt Lake City real estate agent, nurse, and a homeless woman. This is a cast that deserves every award in the book! One marvels anew at the epic scope of Kushner’s vision, and Elliott captures every nuance, directing the intimate domestic and hospital scenes with wonderful sensitivity. There are many extraordinary setpieces, directed with consummate stagecraft, such as the overlapping arguments between Joe and Harper and Prior and Louis as their respective relationships disintegrate, Prior’s visitations from his medieval ancestors, the Angel’s scary appearances (Lawrence is manipulated like a puppet by several handlers), and Prior’s ascent to Heaven. The sound effects and music are all fabulous. 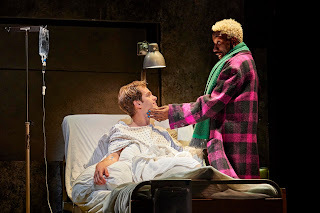 Ian McNeil’s outstanding scenic design, which makes use of a revolve and a rising platform, brilliantly etches the various locales from Central Park’s Bethesda Fountain to hospital rooms to the Mormon Visitor Center at Lincoln Center to Heaven itself. Nicky Gillibrand’s costumes, Paule Constable’s lighting, Adrian Sutton’s portentous music, Ian Dickinson’s sound design all add up to an ace production team. “Millennium Approaches” is just over three and a half hours, and “Perestroika” is four (each with two intermissions), but the time flies. I saw it on two consecutive nights, and the audience went wild after each, roaring its approval, and leaping to its feet as one the second each play ended. It all adds up to a magnificent experience, demonstrating how powerful theater, at its finest, can be. Not to be missed.